Our most popular questions have been compiled below for your convenience to make your experience with Lancôme as enjoyable as possible. Lancôme is dedicated to providing you with a superior level of customer service. We look forward to helping you. Open your eyes to a bigger world. Introducing La Vie est Belle, a floral bouquet of Iris, Jasmine, Orange Blossom and Patchouli. The fragrance of joyful femininity and happiness. The manifesto of a new era. 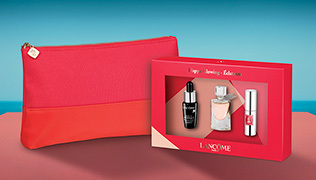 Get notified first about new Lancome products and continue to enjoy beauty tips, exclusive online offers, luxury samples and much more by subscribing to our newsletter. Lancome is dedicated to providing you with a superior level of customer service. Click here to send your question. Looking for a bit of beauty advice? Look no further. We've gathered a comprehensive directory of our most frequently asked questions, just for you.